At D23 we got our first real look at Star Wars: Rogue One. We were treated to the first image of the film, a cast photo, and some details about the upcoming side-story. 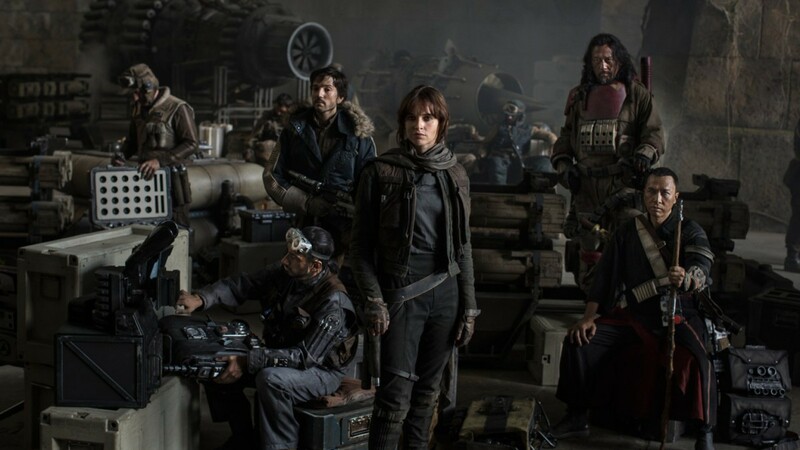 We already knew that Felicity Jones was going to be a main character but it was also revealed that joining Jones will be Donnie Yen, Forest Whitaker, Mads Mikkelsen, Diego Luna, Ben Mendelsohn, Jiang Wen, Alan Tudyk, and Riz Ahmed. Behind the camera, Greig Fraser (Zero Dark Thirty, Foxcatcher) will be director of photography and Neil Corbould (Black Hawk Down, Gladiator, Saving Private Ryan) will be special effects supervisor. Doug Chiang (Star Wars: Episodes I-II, Forrest Gump) and Neil Lamont (Harry Potter, Edge of Tomorrow) will be the production designers, Rob Inch (World War Z, Captain America: The First Avenger) will be stunt coordinator, Neal Scanlan (Prometheus) will be creature effects supervisor, and Dave Crossman (Harry Potter, Saving Private Ryan) and Glyn Dillon (Kingsman: The Secret Service, Jupiter Ascending) will be co-costume designers. Not only will we be getting a ‘blind-space cowboy-Ip Man’, Rogue One will “tell the story of resistance fighters who have united to steal plans to the dreaded Death Star.” Could these be those ‘Bothan spies that died to deliver the plans’ from the original Episode 4 or could there be a new Death Star under construction? We will know more December 16, 2016 when Rogue One hits theaters.